There is car parking on the roadside layby on the B6255 Low Sleights Road, a couple of hundred metres north-east of the Old Hill Inn. The owners of the pub will take a dim view of walkers leaving their cars in the pub car park and the parking area opposite. North Yorkshire Police have also been known to slap tickets on cars causing obstructions on the road. A track leaves the road and continues across the limestone pasture to open access land. Alternatively, a small gated stile a few metres left of the pub leads to a path that joins the track. The track leads to the limestone pavement and passes the huge shakehole of Braithwaite Wife Hole on the left before the rise to High Lot begins. A short section of wooden boardwalk is succeeded by a stone-flagged section, with good views to the right of Ingleborough’s escarpments and plateau. The route steepens beyond the wall corner and the rough path zigzags up to meet a nick that, in wet weather, is likely to have a fair amount of water cascading over it. This is the section that requires care and is the most lung-busting of the walk, as 80m rise is achieved in just 150m. Turn right and tackle the shoulder of Ingleborough – Swine Tail. The path sticks to the right-hand side of the shoulder after the path from Horton in Ribblesdale joins it from the left. A few more gasping breaths will take you to the broad summit plateau. If you’re planning to return by the same route, make a note of the location – it’s easy to miss when trying to find the exit off the plateau. In clear weather, make a beeline towards the cross shelter, which will soon be seen on the horizon. A feint path can just be made out in the stony ground of the gently sloping, broad table of the fell’s summit. In poor visibility, keep the plateau edge to your right for 250m before heading to the left to find the shelter. 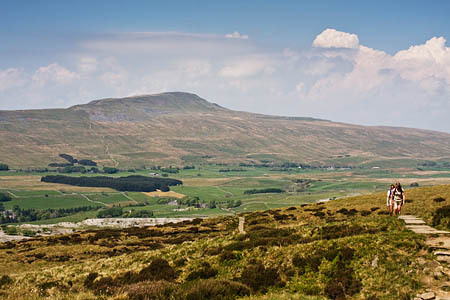 There are few days when you will have Ingleborough’s summit to yourself, but the climb is worth it, with views to Morecambe Bay, the Lake District fells, Wild Boar Fell, the Bowland fells and Pendle Hill and even a distant view of the northern Peak District. Plus, of course, Ingleborough’s fellow Three Peaks, Whernside and Pen-y-ghent.